If you are like me, a deadline can be important for keeping your training on track. We start with an admirable, and even achievable, goal, like improving our fitness or losing a few pounds. However, it is easy to lose momentum once we start making progress toward the goal and the ‘pain’ that motivated us initially is no longer as great. That’s where committing to a specific race can help to maintain the momentum. An impending race is what many of us need to remain focused. I know that registering – and paying for – a race works because this is my story. This is also a reason many local fitness centers, community recreation centers, and even YMCAs sponsor triathlons, like the South Davis Labor Day Triathlon. These races provide its members the much-needed deadline and focus for training. And, they usually come at a reasonable and affordable fee, especially when you consider the t-shirt and other swag that participants receive. Read on for my experience at the South Davis Recreation Center managed Labor Day Triathlon. The Bountiful, Utah triathlon was one stop on a roughly two-week road trip to complete triathlons in Utah, Oregon, and Washington, all within a seven-day period. Joy’s and my route to Bountiful (Salt Lake City) from our Minnesota home included an overnight stay in Omaha, Nebraska with our son, daughter-in-law, and two granddaughters. From here, it was a comfortable, albeit long, day’s drive to the Salt Lake City area. Touring the Latter-Day Saints Conference Center. Listening to an organ recital at the Mormon Tabernacle. Walking in and around the Great Salt Lake. On Sunday afternoon, Joy and I drove the bike course for the triathlon, a typical pre-race ritual. We were unable to drive the entire course since several miles of the course was on a combination bike and walking/running trail near the Legacy Nature Preserve. Bountiful, Utah is a northern suburb of Salt Lake City that sits at around 4,300 feet elevation. This is high enough for someone from the middle plains of the USA to feel the effects of the altitude, especially during biking and running. The Labor Day Triathlon is part of a series of races organized and managed by the South Davis Recreation Center in Bountiful. The event included both sprint and novice triathlon distances with a sprint relay option. Logo on the t-shirt provided to participants of the 2015 South Davis Labor Day Triathlon. The triathlon made use of the Center’s 14-lane pool. The transition area for the triathlon made use of the parking area for the Bountiful City Park located immediately behind the fitness center. The 350-yard (320 m) swim followed a serpentine path across the 14 lanes of the 25-yard long pool. Before the start of the triathlon, swimmers lined up in order of the time in which they anticipated completing the swim. Every few seconds, a swimmer would jump into the first lane and swim to the other end. At the end of the first length, we ducked under the lane divider and swam back to the starting end in the second lane. It was then under the lane divider for a swim to the other end of lane 3. For the sprint distance race, this process was repeated for each lane of the pool. After 14 lengths, we got out of the pool and walked or jogged out of the pool area onto the outdoor sidewalk leading to the transition area and our bikes. The initial and final portions of the relatively flat bike course were on the streets of Bountiful. An intermediate section of the course followed the bike trail next to the Legacy Nature Preserve. While we had driven the road portion of the course the day before the race, we obviously could not drive on the bike trail portion. Neither had I taken time to ride the trail portion. With swimmers starting one at a time, bikers were also spread out along the course. In fact, there were times, especially on the portion along the Preserve, when I did not see another biker. At one point, I was sure that I had missed the turn-off and was on my own. I knew that the course eventually turned onto a path leading back to the streets. All of sudden, I realized that there were no other bikers around me and began to worry that I had already passed the turn. I decided to trust the race directors to have clearly marked the course or to provide a volunteer to keep racers on course. Sure enough, a few blocks ahead, I found the sought-after volunteer. A quick turn, followed by a ride of about one block on a section of the trail, and I was in the parking lot heading back onto the city streets and toward the transition area. Triathlon Tip: Many athletes, including elite triathletes, have lost races by missing a turn on the race course. This has occurred despite the best attempts of race directors to mark all turns. Take advantage of race course maps and instructions provided before the race to become familiar with the course. Ironically, being familiar with the course is more important for races with fewer participants, for which the spacing between racers is often greater. The run course left the transition area, heading west about a block to the street that passes in front of the South Davis Recreation Center. With the first of five right turns complete, the run on this flat course continued along a rectangular path on the sidewalks of the streets north of the South Davis Recreation Center. It was during this leg that I felt the effect of the altitude. Fortunately, there were many supporters shouting out their words of encouragement to a background of ringing cowbells. Their music provided the much-needed distraction as I worked my way toward the finish line. With the race complete and a long drive ahead of us, Joy and I headed back to the hotel for a quick shower. We packed the rest of the luggage into the back of our van and headed to our next destination. It turned out that this would be Bend, Oregon. First triathlon on a weekday. Initial race on a national holiday. First race in which part of the bike course was a biking/running/walking trail. Does competing in a triathlon with several hundred or even thousands of participants intimidate you? Don’t let that stop you. There are many smaller, competitive, and well-run races from which to choose. I learned about the WinSprint Triathlon on a favorite website, Running in the USA, while searching for triathlons in the southeastern states. In the end, Joy and I put together a string of five triathlons on five consecutive weekends during a road trip in the fall of 2018 to celebrate our 45th wedding anniversary. After the North Carolina Triathlon on the previous Saturday, Joy and I took a leisurely path to Daniel Boone country in northeastern Kentucky. Enroute, we toured portions of western North Carolina and communities around the Great Smoky National Park in eastern Tennessee. Actually, this was the second time in Kentucky during this road trip. The first visit was between the Ohio and Tennessee triathlons in the second week of the trip. During the first trip, we were able to try our hand at tent camping. This time, however, it was without the rain, in Big Bone Lick State Park in northwestern Kentucky. 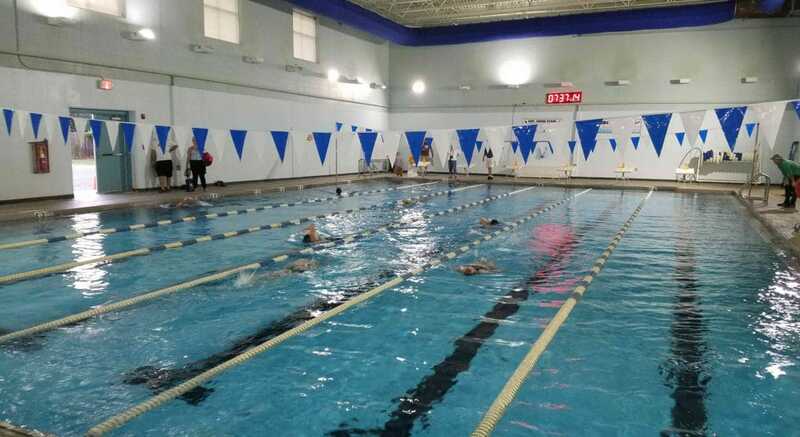 The WinSprint Triathlon is organized and managed by the staff of Winchester – Clark County Recreation Center (WCCRC), which is housed in the former site of Southeastern Christian College. According to April S. of WCCRC, the number of participants in the WinSprint Triathlon has grown each year. Starting with 40 participants in 2016, the race’s first year, the number of racers jumped to 80 in 2017, its second year. In this, the third year, registration exceeded the initial cap of 100 participants set by recreation center management. The cap was based on the capacity of the WCCRC facility and the number of participants that could complete the event within the half day allotted to it. While Clark County was well represented among the participants, about 60% of the participants came from outside the immediate area. The race had a family-friendly feel to it with lots of children visible on race morning. A special feature of this race was the availability of free daycare. Race organizers provided this for parents who needed their children watched while they raced. 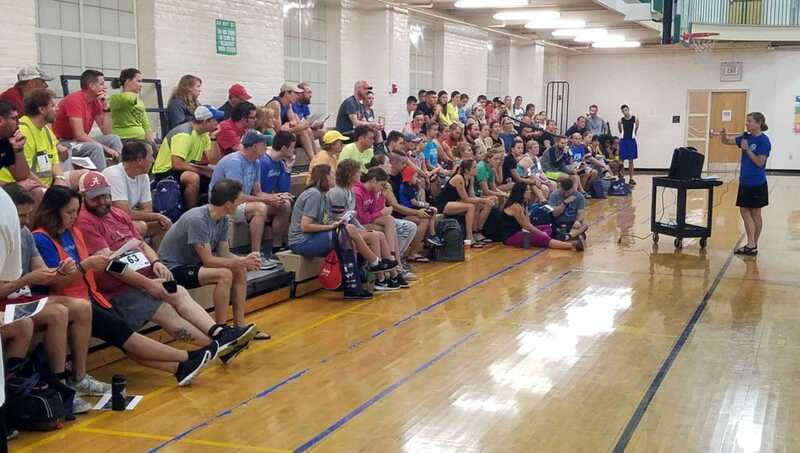 A pre-race meeting for the Kentucky triathlon was held in the gymnasium of the Winchester – Clark County Recreation Center. Another unique feature of this race, one that I like, was the lottery for the position (bike rack number) within the transition area. During packet pickup on race morning, triathletes selected a colored piece of paper with a number. Mine had the number 12 on it. The number on the paper corresponded to the number on the rack on which we placed our bikes. The lottery had two benefits. First, it controlled the number of bikes on a given rack. This ensured that each racer had roughly the same space in which to set out their gear within the transition area. The second benefit was that it prevented a rush on race morning to get the best locations in the transition area. Unlike most triathlons, the bike out/in and the run out locations were on the same end of the transition area. With this arrangement, there was an advantage, albeit small, to having one’s transition space near the bike out/in end of the transition area. The transition area of the WinSprint Triathlon was on a section of Wheeler Avenue in front of the Winchester – Clark County Recreation Center. The swim was organized in waves. Waves began at 15-minute intervals. Two swimmers were assigned to each of five lanes of the 25-yard long pool. A sixth lane remained open for swimmers who required more than the allotted 15 minutes to complete the swim. Swimmers swam eight laps (sixteen lengths). Volunteers notified each swimmer when they were beginning their final lap and when they had completed all laps. Once the swim had been completed, athletes either left the building for the outdoor transition area (using the door in the picture below) or, if they were participating in the stationary bike event, left the swim area for a nearby room containing the stationary bikes. 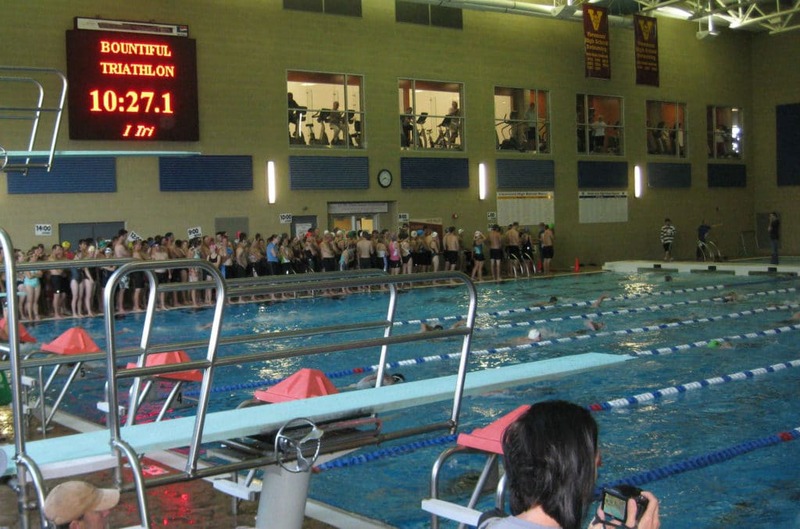 The swim for the WinSprint Triathlon was held in the 25-yard WCCRC pool. It had the shortest bike leg of any of the more than 40 triathlons I have completed. It was the first to include a stationary bike option for the bike leg. For the stationary bike option, the rider used a bicycle within the fitness center to ride the 6.2 mile (10 km). Of course, there were no hills and there was no wind working for or against the rider while on the stationary bike. Not surprising, times on the stationary bikes were less than those on the road bikes. The fastest bike split (time on the bike) for an individual sprint triathlete competing in the stationary bike event was 13:16. This compared to the fastest bike split of 17:31 for the road bike event. The temperature on the bike course was comfortable, in the low 70’s ⁰F. The course left the transition area following city streets to Boonesboro Avenue, a county highway that led southwest out of town toward the turnaround at George Rogers Clark High School. Upon reaching the entrance to the High School, I turned into the parking lot. There were no other bikers around me, though there were plenty of volunteers whose instructions I thought I followed correctly. I continued straight ahead, riding counterclockwise around the school building. Passing another volunteer in a parking lot behind the school, I continued up the hill leading to the exit of the property and back toward the highway. While riding the last few hundred yards to the exit of the school grounds, I met other bikers going in the opposite direction of me. I am still not certain if I followed the right course or if I should have gone clockwise around the building. The bike course map on the race website did not show this detail. Triathlon tip: One strategy that helps to shave a few seconds off the overall race time is to leave my bike shoes connected to the pedals. After a few pedal strokes, I coast and slip my feet into the bike shoes. This requires practice so don’t plan to try this for the first time on race day. Before dismounting at the end of the bike leg, I slip my feet out of the bike shoes which stay clipped into the pedals. The picture is courtesy of WinSprint Triathlon. The run course took us through neighborhoods near the Recreation Center. I knew from April that the course was hilly. In fact, there were few flat sections on the course, even though none of the hills was especially long or steep. There was plenty of moral support and encouragement along the course. There was also water. In fact, I still chuckle each time I recall the young girl who passed out water at the mid-point of the run course. As I took the cup of water, she told me that I could throw my water cup on the ground. 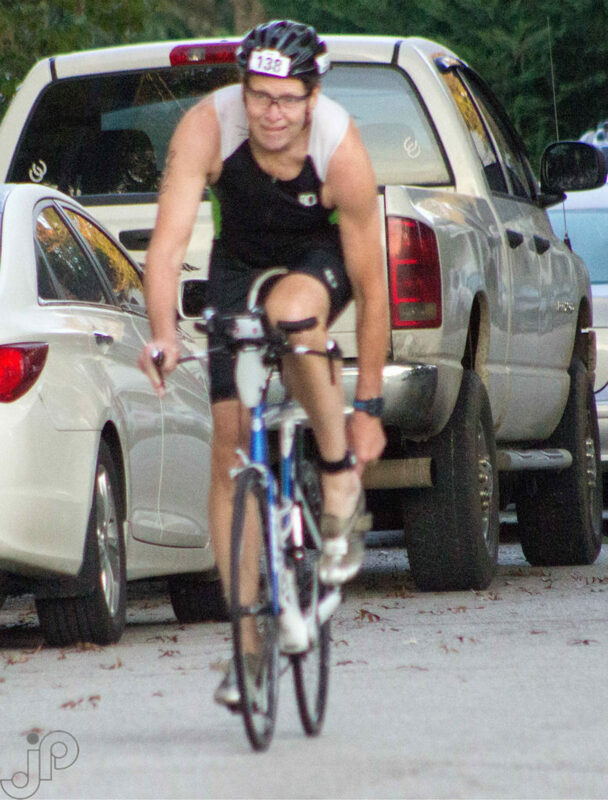 Smiling, I tucked the paper cup into the pocket on the back of my triathlon suit and headed onward to the finish. After crossing the finish line and turning in my timing chip, I downed some liquid refreshment and a banana. Having the race gear back in the van, we headed back to the hotel for a shower. With the fifth of the five fall triathlons complete, we started our return home. First triathlon at which daycare was provided for participants. First triathlon with a stationary bike option.